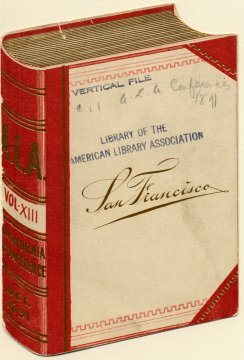 In 1891 the American Library Association held its first conference on the West coast in San Francisco. It was the thirteenth conference of ALA, and Library Journal called it the least effective of any of the annual meetings of ALA. ALA President Samuel S. Green, who had stepped in to replace an ailing Melvil Dewey, said that there was so much entertainment the members were not fit to do any work. He suggested that future conferences be held at quiet, "less seductive places". [Source: Dennis Thomison's A History of the American Library Association 1876-1972 (ALA, 1978)]. Taking Green's advice, ALA did not meet again in San Francisco until 1939, 48 years later. In later years, San Francisco was, not surprisingly, one of the most popular conference sites for ALA. I've had the pleasure of attending six conferences in this wonderful city. Probably due to costs, ALA has not met in San Francisco since 2001. However, ALA will return to San Francisco in 2015. The book shaped publication shown here is the ALA Handbook of the San Francisco Meeting 1891. It measures approximately 3 1/2 inches by 5 inches and is less than 25 pages in length, a far cry from today's enormous conference programs. This particular copy was discarded from the Library of the American Library Association and came to me via the Library History Round Table auction at Library History Seminar XII. It was donated to the auction by Norman D. Stevens. I have a previous blog post about the 1891 conference. I also have an online exhibit of ALA's history which includes artifacts from other ALA conferences.